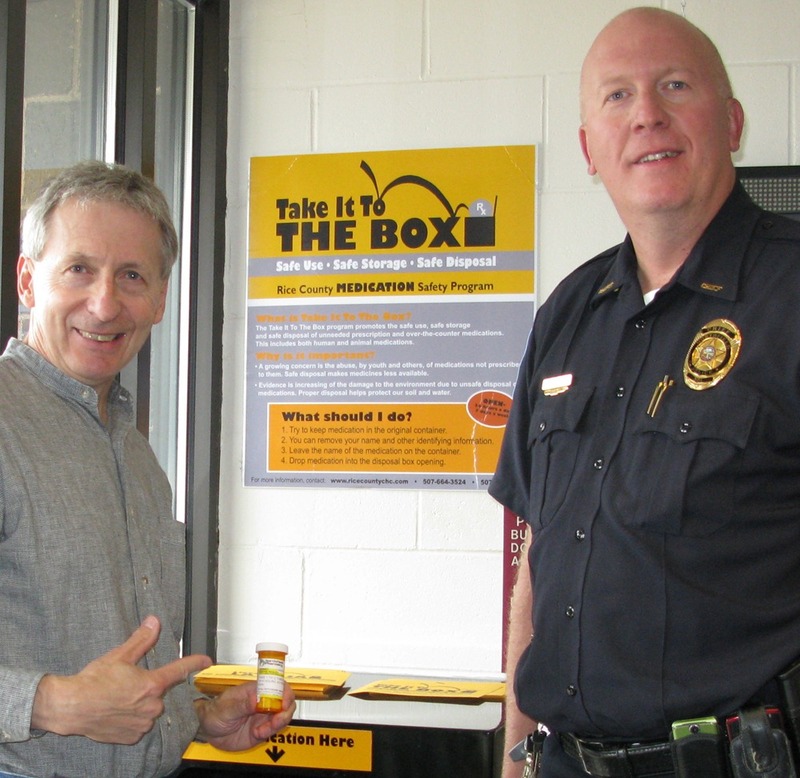 In last week’s Friday Memo, Northfield Police Chief Mark Taylor announced the new Rice County Medication Safety Program named Take it to the Box. Chief Taylor cited the efforts of Mary Nelson, a member of the Mayor’s Task Force on Youth and Alcohol and Drug Use, for her work on this program. 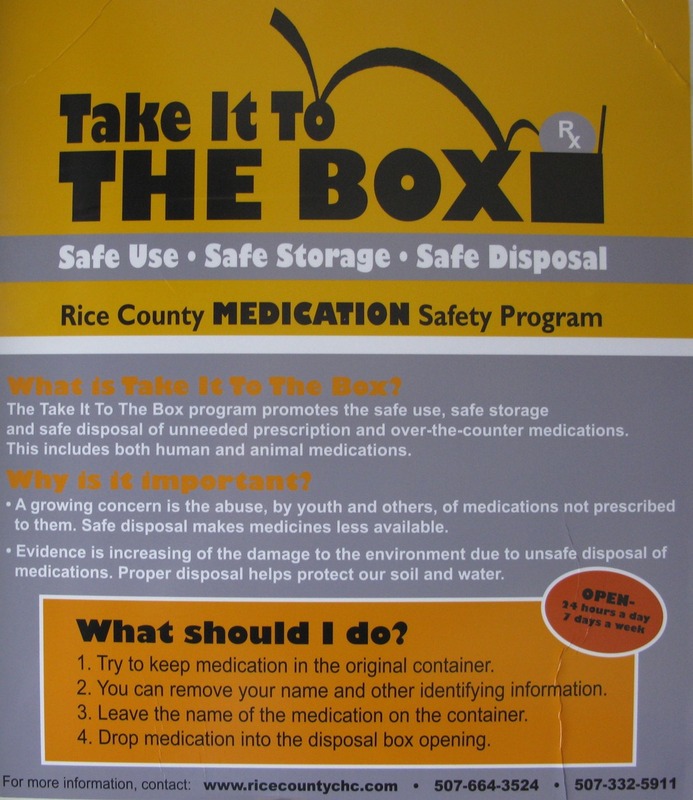 Take it to the box- A prescription drug disposal program will start on Tuesday September 22, 2009. This program will feature two drop boxes in Rice County. One will be at the Northfield Police Department and the other at F aribault P.D. The public will be able to come to the police station and place their unused, unneeded prescription drugs in a drop box in the police station lobby. This is an anonymous program encouraging person(s) to remove their name from labels, leaving the drug name to aid us in safe disposal. Two of the main goals of this program are; safe disposal will impact/reduce opportunities for drugs falling into the wrong hands, leading to drug abuse. Secondly, safe disposal ensures drugs do not end up in landfills, city water, etc. having an environmental impact. The box will be available during all hours. This project was a large undertaking that took the cooperation and hard work of many organizations. 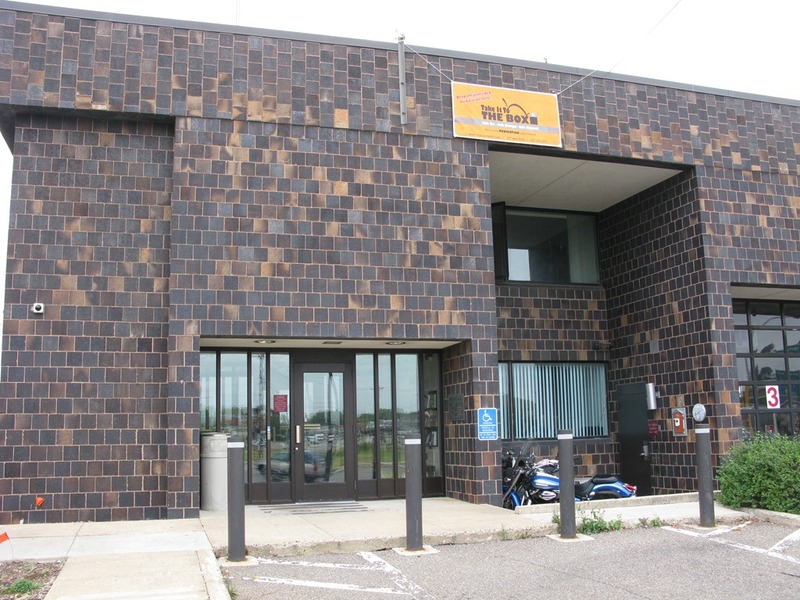 They include: Rice County Chemical Health Coalition, Northfield Healthy Community Initiative (HCI), Northfield Hospital, Faribault Police, Northfield Police, Northfield Mayor’s Youth Task Force on Alcohol and Drug Abuse, and the Rice County Drug Task Force. A special thank you to Northfield resident Mary Nelson, who contributed countless hours on this project. Drug-sniffing dogs in the schools: what’s the rationale?